The brown garden snail (European brown snail), Cornu aspersum, was described by O.F. Müller from specimens collected in Italy. This plant feeder has been disseminated into many parts of the world intentionally as a food delicacy, and accidentally by the movement of plants and by hobbyists who collect snails. It was introduced to California in the 1850s as a source of escargot. It has adapted well to California and is a very troublesome pest of crops and ornamentals (Capinera 2001). Figure 1. Adult brown garden snails, Cornu aspersum (Müller). Photograph taken in southern San Diego County, California. Photograph by Bill Frank, Jacksonville Shell Club. Snails belong to the class Gastropoda. They prefer an undisturbed habitat with adequate moisture and good food supply. The snail body is protected by a hard shell, usually marked with spirals. Most land snails are nocturnal, but following a rain may come out of their hiding places during the day. They move with a gliding motion by means of a long, flat, muscular organ called a foot. Mucus is constantly secreted by glands in the foot, which facilitates movement and leaves a slimy trail. 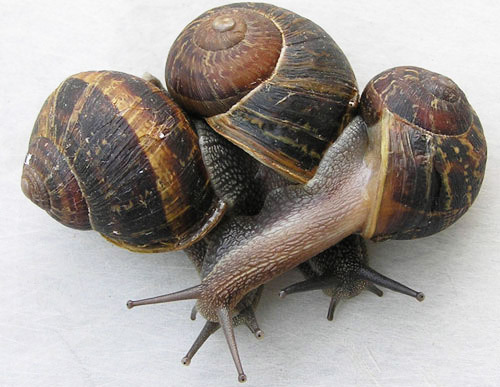 The reproductive organs of both sexes occur in the same individual and each snail is capable of self-fertilization, although cross fertilization is normal. Adults deposit eggs. Burch (1960) reports natural distribution in Britain, western Europe, and along borders of the Mediterranean and Black Seas. It has been introduced into the Atlantic Islands, South Africa, Haiti, New Zealand, Australia, Mexico, Chile and Argentina. In the United States, Capinera (2001) reports its distribution in California and along the west coast north to British Columbia, Canada, in most southeastern states and along the east coast north to New Jersey. However, it has not developed the serious pest status found in California throughout its range. Although occasionally intercepted on plant shipments to Florida, it has not become established in Florida. The shell is large, globose, rather thin, imperforate or nearly so, moderately glossy, and sculptured with fine wrinkles. 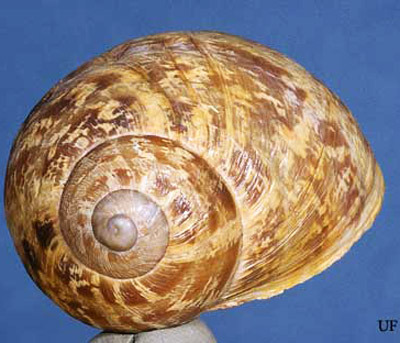 The shell may be either yellow or horn-colored with chestnut brown spiral bands interrupted by yellow flecks or streaks. The aperture is roundly lunate to ovate-lunate, with the lip turned back. Adult shells (four to five whorls) measure 28 to 32 mm in diameter (Burch 1960). Figure 2. Extended adult brown garden snail, Cornu aspersum (Müller). Photograph by Bill Frank, Jacksonville Shell Club. Figure 3. 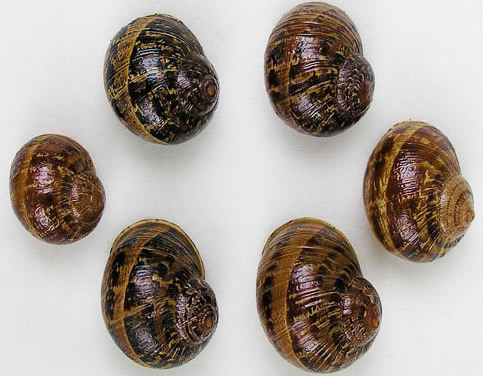 Shells of the brown garden snail, Cornu aspersum (Müller), displaying various color shades encountered. Photograph by Bill Frank, Jacksonville Shell Club. Figure 4. The brown garden snail, Cornu aspersum (Müller), showing yellow coloring. Photograph by Paul M. Choate, University of Florida. Figure 5. 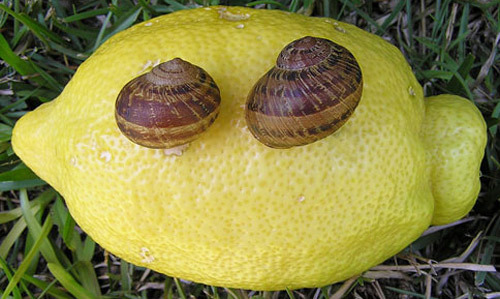 Adult brown garden snails, Cornu aspesrum (Müller), size comparison on an oversized 160 mm lemon. Photograph taken in southern San Diego County, California. Photograph by Bill Frank, Jacksonville Shell Club. Mating requires four to 12 hours. Oviposition occurs three to six days after fertilization. White spherical eggs about 1/8 inch in diameter are deposited in a nest constructed by the snail. The snail builds the nest by using its foot to shovel soil upwards. The nest is about 1 to 1.5 inches deep. The egg mass is concealed by a mixture of soil, mucus, and excrement. The number of eggs deposited at one time varies from 30 to 120 (Capinera 2001). Basinger (1931) reported an average of 86 eggs laid during each oviposition. Frequency of oviposition is subject to temperature, humidity, and soil conditions. Low temperature and low humidity inhibit the activity of the snail, and dry soil is unsuitable for the preparation of a nest. During warm, damp weather, oviposition may occur once a month. If each individual is capable of laying eggs once every six weeks from February to October, then oviposition occurs approximately five times a year and 430 eggs are laid (Basinger 1931). During the summer months, the eggs hatch in about two weeks. The shells of hatchlings are fragile and translucent. Maturity requires about two years in southern California. In South Africa the snails take about 10 months to become mature, producing one generation a year (Gunn 1924). When dry conditions prevail, the snail may seal itself to various objects or close the shell opening with a parchmentlike epiphragm. The snail becomes active again in humid conditions. Brown garden snails attain a diameter of 16 to 20 mm within one year, and 26 to 33 mm by the second year. These snails are nocturnal and feed on organic matter in the soil, tree bark, and vegetation. Nearly anything growing in a vegetable or flower garden can be consumed. They normally feed only within the temperature range of 5 to 21°C (Capinera 2001). Buxus microphylla 'Japonica' (California boxwood), Crinum sp., Cupressus sempervirens L. (Italian cypress), Grevillea sp., Hibiscus spp., and Juniperus spp., Rosa sp., and other unidentified plants and shrubs at the Davie, Florida, infestation (1969). Vegetables: cabbage, carrot, cauliflower, celery, bean, beet, brussels sprouts, lettuce, mangel, onion, peas, radish, tomato, and turnips. Cereals: barley, oats, and wheat. Flowers: alyssum, antirrhinum, aster, balsam, carnation, candytuft, chrysanthemum, dianthus, dahlia, delphinium, hollyhock, larkspur, lilies, marguerite, mignonette, nasturtium, pansy, pentstemon, petunia, phlox, stock, sweet-pea, verbena, and zinnia. Trees: apple, apricot, citrus, peach, and plum. Shrubs: hibiscus, magnolia, and rose. Snails feeding on cultivated plants may become serious pests. In California, enormous snail populations may become established in citrus groves and cause serious damage to leaves and fruit (Basinger 1931). They also cause economic damage to truck crops and ornamental plants. Large numbers of snails are a nuisance around a residence. Figure 6. 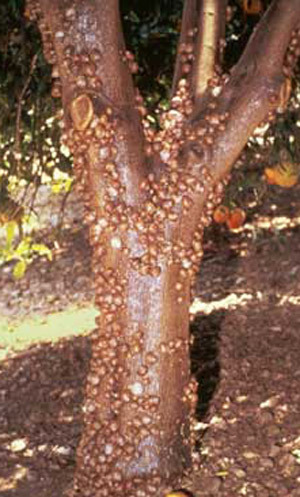 Infestation of brown garden snail, Cornu aspersum (Müller), on a citrus tree in California. Photograph by Division of Plant Industry. Management of the brown garden snail is a four-step process that involves pruning tree skirts, banding tree trunks with copper foil or a basic copper sulfate slurry; putting out poison bait to reduce their populations; and making releases of the predatory decollate snail, Rumina decollata (UC/IPM 2009). Habitat reduction will aid in control. Remove anything snails may hide under: boards, bags, brush and debris. During the night, place a board on the ground near damaged plants. Elevate the board with four stones placed under the corners. The snails will take shelter under the board in the morning and can be removed and destroyed by dropping them into a jar filled with water and a little rubbing alcohol. Some birds, especially ducks, will feed on these snails (Garofalo 2001). Barriers of diatomaceous earth, sand or ashes provide only temporary control. With a beer trap the goal is to trap and drown snails and slugs in a shallow dish with beer placed slightly below grade so that the lip of the dish is even with the soil. However, this does not provide reliable control (Bradley 1999). The brown garden snail has been eradicated from at least two locations in Florida since 1963 by the Division of Plant Industry. Most infestations are believed to be introduced on shipments of container-grown plants from California. Due to the brown garden snail, various states in the United States have quarantine restrictions concerning plant materials brought in from other states. States with quarantine regulations include Arizona, California, Louisiana, Mississippi, Oregon, South Carolina, Texas and Washington. However, other states may also have quarantines. Check with each state's Department of Agriculture before shipping or taking potentially infested materials to other states. Basinger AJ. 1931. The European brown snail in California. University of California Agricultural Experiment Station Bulletin 151: 1-22. Bradley LK. (November 1999). Snails and slugs in the low desert. University of Arizona Cooperative Extension. (16 June 2011). Burch JB. 1960. Some snails and slugs of quarantine significance to the United States. U.S. Department of Agriculture Research Service 82: 1-70. Garofalo JF, Weissling T, Duke ER, Vedaee J, Bishop L. 2001. Snail and slug management in south Florida. Miami-Dade County Cooperative Extension Service. Gunn D. 1924. The brown and grey snails: Two destructive garden pests. Journal of the Department of Agriculture (Union of South Africa) Reprint No. 42: 3-10. Authors: G.W. Dekle, Florida Department of Agriculture and Consumer Services, Division of Plant Industry; and T.R. Fasulo (retired), University of Florida. Originally published as DPI Entomology Circular 83. Updated for this publication. Publication Date: October 2001. Latest revision: July 2014. Reviewed: December 2017.